Nancy Drew and the Clue Crew are off to the beach—and sleuthing for ghosts! Nancy and her friends are headed for the shores of Cape Mermaid, New Jersey, where they are hoping to spend a fun-filled week. But as soon as they arrive at an old inn on the beach, strange things start to happen—spooky noises, a message for help, and a possible ghost sighting. Could the rumored ghost of Cape Mermaid actually exist? Or is there more to the story than meets the eye? It’s up to the Clue Crew to solve the mystery! “I can smell the ocean!” eight-year-old Nancy Drew exclaimed as she rolled down the car window. “I can hear seagulls!” George Fayne added excitedly. “Pleeeeeease?” Nancy and George chimed in. Nancy craned her neck for a better look. Ahead of them was a big Victorian mansion. It was pale blue with purple shutters, and it had a gold weather vane on top in the shape of a mermaid. The sign in front read: MERMAID INN, 1879. Nancy, Carson, Hannah, and Nancy’s best friends, George and Bess, were visiting Carson’s cousin Claire Katz. Claire and her husband, Leo, owned the inn, which was in the seaside town of Cape Mermaid, New Jersey. The Katzes had two daughters: Tessie, who was ten, and Amanda, who was six. Carson, a lawyer, was going to do some legal work for Leo and Claire. While he was busy, Nancy, George, and Bess were going to explore Cape Mermaid with Hannah. Nancy couldn’t wait! Carson pulled into the driveway and parked the car. Nancy and her friends grabbed their rolling suitcases from the back and half-ran, half-walked through the front yard. Seashells crunched under their feet on the path, which wound through a garden full of fragrant roses, honeysuckle, and lavender. Nancy could make out a pale stretch of sandy beach just beyond the backyard. The front door burst open just before they reached it. “Yay, you’re here!” a little girl said, jumping up and down. She had short, wavy brown hair, and she was wearing a polka-dot bathing suit, a pink ballet tutu, and one orange flip-flop. “You must be Amanda,” Carson said as he and Hannah caught up to everyone. A second girl joined Amanda, dressed in a white beach cover-up. She was taller, with shoulder-length, dark blond hair. It was hard to see her face, though, because she was holding a small purple video camera in front of it. A little red light was flashing, which meant that it was in record mode. “I would have no idea how to work one of those,” Hannah joked to Carson. Nancy and the others followed the two sisters inside and down a long hallway. The inside of the inn was as beautiful as the outside, with pale blue walls, white wicker furniture, and vases of fresh flowers. A couple of cats were sitting on a windowsill, grooming themselves. In the kitchen at the end of the hall, Claire was standing at the stove, stirring sauce in a large pot. Leo was at the sink, chopping vegetables. Nancy didn’t remember them except from photos. Nancy’s parents had brought her to Cape Mermaid when she was just a baby. Her mom had died when she was three years old, and Hannah had helped take care of her ever since. Carson introduced everyone. “George and Bess are cousins. They’re in the same class as Nancy,” he finished. “Carson, didn’t you mention in an e-mail once that these girls are detectives?” Leo asked with a wink. “Detectives? What kind of detectives?” Tessie asked curiously. 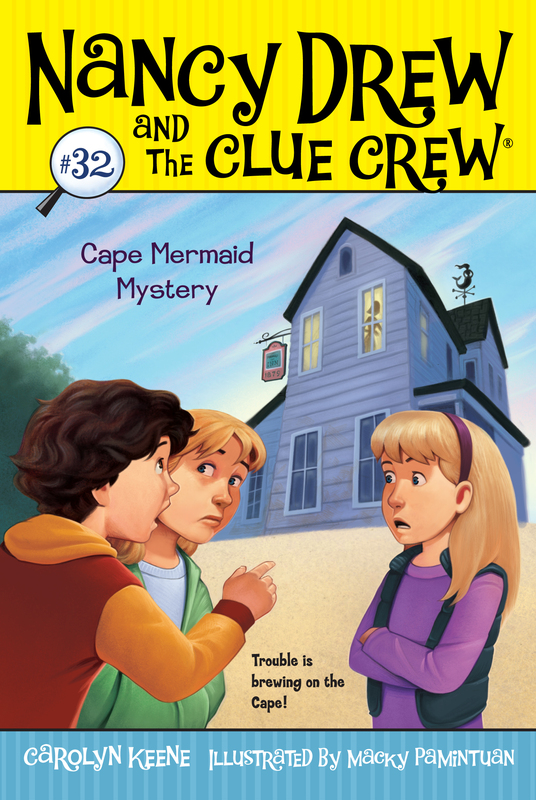 “We have a club called the Clue Crew, and we solve mysteries,” Bess replied. “All kinds of mysteries. Once, we figured out who took a bunch of newborn chicks from our classroom. And another time we found a supervaluable pet bug that was missing,” Nancy explained. “Bugs? Ew!” Amanda said, making a face. “What can we do to help?” Carson asked. “Nothing at all. Let me show you your rooms, then we can come back down for Claire’s famous spaghetti and meatballs,” Leo said cheerfully. “You guys are going to love Cape Mermaid. There’s so much to do here!” Michaela said. “Yeah, like whale-watching. And shopping. And eating tons and tons of candy at the Candygram Shoppe,” Emma added. Michaela and Emma were Tessie’s two best friends from school. Michaela had a habit of twirling her long, pale blond hair. Emma wore a red baseball cap over her curly brown hair. Dinner was over. Michaela, Emma, and Tessie were hanging out with Nancy, George, and Bess in their room while they unpacked. Nancy loved the room, which had rose-print wallpaper and big windows that overlooked the ocean. There was an antique bookshelf with a bunch of kids’ books, seashells, and a small marble mermaid statuette. “Sure. Are you making a movie or something?” Nancy asked. “I just like to shoot a bunch of random stuff,” Tessie cut in. She stared pointedly at Michaela and Emma. “Don’t you guys have to be home by now? It’s eight.” She tapped on her watch. Michaela and Emma exchanged a glance, then jumped to their feet. “Oh, yeah! It’s late! Bye!” Emma said, waving. “Maybe we can all do something tomorrow,” Michaela suggested, grabbing her ballet bag. The two girls took off. As Nancy, Bess, and George finished putting their clothes away, Tessie told them about more fun things to do in town. Nancy was about to reply when she heard weird noises upstairs. It sounded like a soft crash, then footsteps, then something being dragged across the floor. The other girls heard it too. “What is that?” George whispered to Tessie. Nancy and her friends followed Tessie out of the room. At the end of the hallway, she opened a door that led to a set of narrow, carpeted stairs. She switched on a light and also grabbed a flashlight that was hanging on the wall. The girls soon reached the top of the stairs. Nancy glanced around the attic, which was jam-packed with dusty furniture, old toys, and cardboard boxes. Even though the space was hot and stuffy, she couldn’t help but shiver a little. Tessie arced her flashlight this way and that. “Marshmallow Fluff? Vanilla Cream? Are you up here?” she called out. The beam of her flashlight lit up something on the wall. “Look!” Bess cried out, pointing. Someone—or something—had scrawled the words HELP ME in a layer of dust.